Providing care to a loved one can be a very rewarding, yet time consuming and tiring job. At Arbor Village, we understand that no matter how dearly loved, their caregivers do need to rest from time to time. As the primary caregiver for a loved one with Alzheimer’s or other memory diseases, there is little time left for personal activities or errands. Vacations or simply taking an evening for dinner and a movie can be difficult. Arbor Village recognizes the sacrifice caregivers make every single day and offers assistance to help in the care of loved ones. 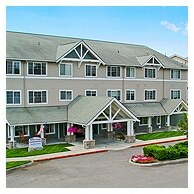 Respite Care at Arbor Village provides a safe, home-like environment for your loved one 24 hours a day, 7 days a week. We understand that, like your loved one, your family dynamic is unique. So here at Arbor Village, we strive to provide complete support for you and your family. Whether you are looking for a short break from care giving for a few hours a day, a week or even for up to 30 days, we can provide your loved one with personalized quality care, and you with the break that you deserve.